“Until the day break, and the shadows flee away, I will get me to the mountain of myrrh, and to the hill of frankincense” (Song of Solomon 4:6). Note: “ ‘Myrrh’ is bitter experience and the wisdom gained through such experience. ‘Frankincense’ represents praise and thanksgiving. Hymns of praise often include the Christian’s gratitude for deliverance from suffering that is beyond human endurance. Such help usually evokes praise and thanksgiving. Of course pleasant experiences also bring forth praise, but the type of praise that arises from suffering is on a higher level than praise from pleasure. Verse 6 alludes to praise that arises from suffering. ‘Until … the shadows flee away.’ The shadows of the nighttime experience of the Church will ‘flee away’ when the Church is complete. These are the shadows of the gospel night, the Passover night. Why is myrrh a ‘mountain’ and frankincense a ‘hill’? Two different Hebrew words are used. Our praise can never reach the mark of perfection. What Jesus offered at Calvary far transcends anything we can offer” (Br. F. Shallieu, Notes on the Song of Solomon, pages 37-38). Here is a recording of Hymn No. 27 from the “Hymns of Dawn” to aid God’s people in singing and making melody in their hearts unto God. Glorious in his works and ways. And our ruined souls redeemed. There our Lord we soon shall see. Watch thy footprints, Lord, to see. Author — John Cennick (1718-1755) wrote the original lyrics to this hymn in 1743. “A prolific and successful hymnwriter, was descended from a family of Quakers, but brought up in the Church of England. He assisted J. Wesley and then G. Whitefield in their labours for a time, and then passed over to, and died as a minister of, the Moravian Church” (https://hymnary.org/person/Cennick_J). THE EPISTLE to the Philippians is one of the most loving of all the Church letters written by the Apostle Paul… The Epistle to the Philippians contains no reproofs, no chidings, such as appear in others of the epistles, but rather it is full of approval, commendation and special love. Apparently, too, this little company of the Lord’s people loved the Apostle as fervently as he loved them. His afflictions on their account bound their hearts to him in lasting gratitude. We find that on at least four occasions they helped to sustain the Apostle; once while at Corinth (2 Cor. 11:9), twice while at Thessalonica (Phil. 4:16), and once while he was a prisoner at Rome. On this latter occasion they sent their gifts and expressions of love by a special messenger, Epaphroditus who, arriving at Rome in the malarial season, took dangerously ill—probably with what is termed the Pontine, or Roman fever. It was on the occasion of the recovery of Epaphroditus and his return to Philippi that the Apostle sent back with him this epistle. A contemporary writer, referring to the practical manifestation of love by the Philippian brethren makes the following comment: “The people of Malta were the only others recorded who expressed their love in this way to Paul. The Ephesians wept over him, but there is nothing said of their expressing their feelings by aiding him. Perhaps they did.” Evidently the Apostle needed some such manifestation of affection and appreciation of his efforts on their behalf, for his own encouragement. It must have been hard, indeed, for him to love the Church at Corinth as he did—laying down his life on its behalf, as well as on behalf of the other Churches—while realizing keenly, as his epistles distinctly intimate, that he was but lightly esteemed in return.—1 Cor. 4:7-9; 2 Cor. 10:10. In view of this close and dear relationship between the Apostle and the Church at Philippi, as between an under shepherd, or pastor and the flock, how full of meaning the first verse of our lesson! “My brethren, dearly beloved and longed for, my joy and my crown,—so stand fast in the Lord, my dearly beloved.” These words from the pen of a conscientious and sincere man, such as the Apostle was, are fragrant with the very essence of Christian love and fellowship. How much they must have been appreciated, and how much they must have been deserved! But if there was nothing in the condition of the Philippians to reprove, they, nevertheless, needed the exhortation to stand fast. They had already, by the Lord’s favor, reached a considerable attainment in the graces of the spirit—they must needs be tested, however, to prove them, to try them; and for this ordeal, which every individual, as well as every congregation of the Lord’s people must expect, the Apostle wished to prepare them—to urge that they do not retreat from the advanced steps of love and obedience already taken—that they continue firm, not, however, trusting to their own strength, but, as he expresses it, that they should “stand fast in the Lord,” trusting in his power, in his grace, sufficient for every time of need. Several of the sisters of this congregation appear to have been prominent helpers in the work, not only when the Apostle was with them, but subsequently. Two of these are mentioned by name (v. 2), and the exhortation that they be of the same mind in the Lord implies that in some respects at least these two were at variance. It is well that we note the Apostle’s language to them very carefully, for there is wisdom in it. He does not exhort them to be of one mind in everything; quite possibly realizing that because of very different temperaments and dispositions, habits of life, etc., this might be impossible; but he does urge them to be of the same mind in the Lord—to preserve a unity of heart and head in all things relating to the Lord and his cause. It will be of advantage to all of the Lord’s people to pursue in such matters the course which the Apostle here advocates—not to attempt to “harmonize all earthly things” under present conditions;—to be content that each should have differences of opinion on various other subjects, and to insist only on oneness, fellowship, union, harmony in the Lord, in the truth, in the spirit of love, and toward all the members of the household of faith. Insistence on more than this—endeavoring to bring all to one view on social, financial and other questions—endeavoring to bring all to one view respecting dress and food, etc., has caused grievous strivings and estrangements between members of the household of faith; and all such endeavors should be recognized as contrary to the Lord’s instruction through the Apostle—contrary to the “spirit of a sound mind”—contrary to the wisdom that cometh from above,—which entreats and exhorts for unity only in the Lord and along the line of questions positively settled by the Lord in the Scriptures—which generously leaves with each full liberty to act and to judge on all questions not positively settled by the Scriptures. We urge that all of the Lord’s dear flock copy the wisdom of the Apostle in this matter, and heed his injunction, given to these two sisters, to let nothing come between them in the Lord. In the third verse of our lesson “Yokefellow” apparently should be written with a capital, as the proper name of a brother in the Philippian Church—not only a Yokefellow in name, but as here declared, “a true Yokefellow,” and, as we might expect, therefore, one who would be ready to cooperate with and to assist others. In the Apostle’s judgment, some others were burdened, needing assistance. He specifies Clement and the two sisters already referred to, whose differences were burdening them. That the differences had not yet extended so as to injure them spiritually, the Apostle firmly believed, and hence he declares that he [R3128 : page 7] still recognizes them as fellow-laborers, still recognizes that their names are in the Book of Life. On this account they should seek harmony in the Lord, and Brother Yokefellow should fulfil toward them the true meaning of his name, by helping them over their difficulties; helping them to preserve the unity of the spirit in the bonds of peace in the Lord. Laying down certain general principles for godly living, healthful for New Creatures, the Apostle exhorts,—“Rejoice in the Lord always, and again I say, rejoice.” This, the Golden Text of the lesson, represents the very essence of Christian living. Under present conditions it is not supposable that outward circumstances will always be favorable to rejoicing, from the natural standpoint. He, therefore, who would rejoice always in the Lord must have faith in the Lord,—trust, hope, love. Without these he could not so appropriate to himself the gracious promises of the Word as to be able to rejoice in tribulation and suffering and under trials and difficulties, and when falsely accused and misrepresented, and when slandered and evilly entreated for the truth’s sake. The only ones who can rejoice always are those who are living very near to the Lord, and who can feel always their oneness with him, and that his protection and care are over them, and that his promise is sure, that all things shall work together for their highest welfare, as New Creatures. Others may rejoice today and be cast down tomorrow; only the faithful in Christ Jesus are privileged to rejoice always. The thought of the Lord’s favors, past, present and to come, makes all the trials and difficulties of such to appear very light afflictions, as but for a moment, not worthy to be compared with the glory, honor and immortality promised, and the blessed privileges of divine service, both here and hereafter. The Apostle emphasizes the matter by saying, “Again I say, Rejoice.” We cannot have too many rejoicing Christians, nor can they rejoice too much, if they rejoice in the Lord. This rejoicing is not necessarily boisterous, nor of necessity the reverse. It implies serenity, happiness, peace, pleasure of soul, however, and does not mean that noisy demonstration is essential, as some seem mistakenly to think. The Apostle further exhorts that the faithful let their moderation, their forbearance, be manifested, not only toward the brethren, but toward all with whom they have to do. The Greek word here rendered “moderation” seems to carry with it the thought of reasonableness, and of not exacting our rights too rigorously. Mercy and leniency are certainly qualities required of all who would be members of the body of the Anointed. Faithfulness in the performance, as far as possible, of all that justice would require of us, and mercifulness in respect to all our requirements of justice from others should be our rule: so shall we be the children of our Father which is in heaven, for he is kind and merciful to the unthankful. “The Lord is at hand!” The thought seems to be that we who are the Lord’s are not living for the present time. We are expecting great changes to be ushered in when our King shall take to himself his great power and begin his reign. We are not to be struggling for the last inch or the last penny, nor for the extreme of our own rights; but, rather, to be so full of rejoicing in the good things coming, and already ours by faith, that it will make us generous as respects the things of this present time in our dealings with the brethren and with others. We are not expecting justice from the Lord, for nothing that we have or done or could do would justly call for such exceeding great and precious things as he has promised us. And as we are expecting grace or bounty in so large measure we can well afford to be generous and liberal in our sentiments toward others—especially toward the household of faith, because they are our brethren and fellow-representatives of the Lord himself, from whom our bounty is to come; and toward the world without, because they have not the future prospects which we possess, and hence set their hearts upon the things of this present time; and we can well afford to accord them their full share of these or more, since we are so rich through our heavenly Father and our heavenly Bridegroom. That the Apostle did not mean to be understood that the Lord’s second advent might be expected momentarily, nor before his death, is evident; for elsewhere in his epistles he clearly sets forth his expectation to die, and to wait for the reward, the crown of righteousness laid up for him; elsewhere also he clearly intimates that the day of the Lord could not come until after the great falling away mentioned in the prophecies, [R3128 : page 8] and the manifestation of the Man of Sin, etc. (2 Tim. 3:7,8; 2 Thess. 2:2-10.) Evidently, therefore, his only thought in this exhortation, “The Lord is at hand,” was, as already suggested—that we are living in the close of the reign of evil, that the dawning of the day of the Lord is not far distant, and that to the eye of faith it is so near that its influence should affect even the smallest affairs of the present life. “Be careful for nothing” is the next exhortation; but since our English word careful has lost its original meaning, there is danger of error here. The word originally had the thought of being full of care—anxiety, trouble. The Apostle’s words correspond exactly to our Lord’s injunction, “Take no thought,” and signify, Be not anxious, burdened, full of care. It is proper that the Lord’s people should be careful, in the meaning of the word careful as used today. We should not be careless, indifferent, loose in our conduct or words, but be circumspect. Anxiety and burdens are unavoidable to those who are depending on themselves, their own wisdom, their own strength, their own skill; but the members of the body of Christ, accepted in the Beloved, adopted into the divine family, sons of God, are assured over and over again in the Word that if they abide faithful all things shall work together for their highest welfare. Why should they be burdened? Why should they feel anxious? He who guards their interests slumbers not. When Christians find themselves anxious, fearful, burdened, the evidence is that they are lacking in faith, and the probability is that they have either never grown to the point of having the proper faith in the Lord, or that they have allowed “earth-born clouds” and cares of this life to come between them and the Lord, so that they no longer have confidence that they are abiding in his love and in his care. All in such condition should go at once to the throne of heavenly grace, and to the divine promises, and obtaining mercy at the former, and feeding upon the latter, they should grow strong in the Lord and in confidence in him, and their corroding cares will give place to faith, confidence, peace of heart, whatever the outward conditions. Such is the counsel of the Apostle—that instead of continuing in the anxious condition, we should lay all of our affairs before the Lord, supplicating his promised providential care, acknowledging our own lack of wisdom;—and gladly accepting his wisdom and the provisions of his love, we should make every request in a spirit of thanksgiving. This spirit of thanksgiving implies a recognition that the circumstances and conditions in which we are, have been supervised of the Lord, and that we are appreciative of his care and trust it for the future. Thanksgiving for what we have, and a full appreciation of the Lord’s leadings hitherto and now, will preclude any anxiety for the future; for the thankful heart will conclude that he who favored us and redeemed us while we were yet sinners will much more favor and do for us now that we are his through the adoption that is in Christ Jesus. The question may arise, Why will not God give us the things which he sees us to need without our making petition to him and claiming his promises? Undoubtedly because we need previously to come into the proper attitude of heart to receive his favors and to be advantaged by them. Even as it is, we may be sure that we do not sufficiently appreciate the divine care bestowed upon us hitherto and now. Even in the attitude of prayer and thanksgiving we probably do not discern one-half of our causes for gratitude, as we shall see them by and by, when we shall know even as we are known. It is the same with natural hunger. Unless we were so constituted that the gnawings of hunger would show us our need of food we would probably appreciate it less, even if we ate as much and with the same regularity. If we have the foregoing described spirit of rejoicing and trust in the Lord, and make all of our requests, so far as we are able to discern, in harmony with his promise, and accept with gratitude and thanksgiving, whatever his providence may send us, then the Apostle assures us, “The peace of God which passeth all understanding shall guard your hearts and your minds in Christ Jesus.” The thought here is distinct. It is not our own peace that is referred to. We may by nature be more or less indisposed to peace, restless, dissatisfied, discontented, fearful, foreboding or quarrelsome; but, following the [R3129 : page 8] course outlined above, we learn to trust God in all of our affairs, and it is the peace of God—the peace which comes to us from a realization of God’s power and goodness and willingness to hold us by his right hand as his children—that comes in, to keep us from worry, from anxiety, etc. The thought is that this peace stands guard continually, as a sentinel, to challenge every hostile or worrying thought or fear. It keeps the Christian’s mind, so that he at heart has peace with the Lord, fellowship, communion;—and it guards his mind also, his reasoning faculties, instructing him and assuring him respecting the divine power and wisdom and love. But it does not assure him of anything respecting his own perfection or worthiness of acceptance before God. This proper peace merely assures us of our standing in divine favor through Christ Jesus,—his worthiness, his sacrifice, his aid. Nor is it sufficient that we are sure of the truth of matters. We are to test them further, and discern to what extent they are honorable, noble; for although the Lord has accepted us, ignoble and imperfect, and has covered the ignoble features of our characters, and proposes to cover them to the end with his own merit, nevertheless, we cannot be in sympathy with the ignoble features of our fallen condition, but on the contrary must desire true nobility, and the highest standards of honor in our hearts, in our thoughts, in all of our dealings with our God and with our fellows. The test of honor is therefore to be applied after the test of the truth. The thing might be true, but Is it honorable to think about it or tell about it? is another question. Another test we are to apply is, Are the things just? We are not to allow our minds to run along lines that would be unjust, and we are to learn to apply this test of justice to every thought and word and act of ours, while learning at the same time to view the conduct of others from a different standpoint;—so far as reason will permit, from the standpoint of mercy, forbearance, pity, helpfulness. But we cannot be too careful how we criticize every thought we entertain, every plan we mature, that the lines of justice shall in no sense of the word be infringed by us with our hearts’ approval. Purity is another quality to be esteemed by us. We are to love and cultivate that which is pure to such an extent that that which is impure will become painful to us, distressing, and we will desire to drop it from memory, and this will only be accomplished by continually thinking upon those things that are pure, and avoiding the giving of thought to the things that are impure. We are to recognize true loveliness, and to esteem it. From our standpoint the impure, the unjust, the untrue, the dishonorable things, cannot appear lovely, desirable, worthy of emulation. When we would think on the purest of things we must of necessity lift our mental vision to as high a point as possible, and, as nearly as we may be able, discern the loveliness of the perfect character of our God and of our Lord Jesus Christ, and proportionately the loveliness manifested in one or another of the followers of Jesus, who walk closely in his footsteps. The mind that frequently calls up the lovely perfections of the Lord and the truth, and is well filled by these, is guarded greatly against intrusions of unlovely and unholy things, contrary to the spirit of the Lord. The Apostle concludes the list, by referring to all things of good repute: things of any virtue or value, things in any degree praiseworthy—the noble words or noble deeds or noble sentiments of anybody, we may safely meditate upon, and as a consequence find ourselves growing toward these ideals upon which our minds, our new natures, thus feed. We will become more and more transformed by the renewing of our minds, and approach nearer and nearer to the glorious likeness of our Lord and Master, being changed from glory to glory, inch by inch, step by step, little by little, during the present life; and our thoughts being in this attitude and our union with the Lord maintained, we shall have part in the First Resurrection, which will perfect us forever in the Lord’s image and likeness. How many (how few!) can say what the Apostle says in vs. 9 ? “The things which ye both learned and received and heard and saw in me, these things do!” This should be the standard of every Christian, because they each and all are representatives of the Lord, ambassadors for him; hence, so far as in them lieth, their conduct and words should be such as would be living epistles, read by the brethren and by the world to profit. No wonder the Apostle adds that, doing thus, “the God of peace shall be with you.” So surely as he was with the Apostle he will be with all others similarly walking in the footsteps of Jesus. “I rejoice in the Lord greatly that now at length ye have revived your thought for me.” These words seem to imply that their thoughtfulness for the Apostle, and earnestness to improve opportunities to serve him, had to some extent relaxed for a time and been revived. Then, as though fearful that his words might be understood as a reproof, he adds, “Ye did indeed take thought, but ye lacked opportunity.” How careful was this man of God not unnecessarily to wound the feelings of the brethren, and how careful we all should likewise be to let the love of God extend, not only to the degree of giving us liberal sentiments toward the brethren, but also to the extent of influencing our tongues and pens not to wound unnecessarily even the least of them. The Apostle hastens to point out that he is not complaining of want. He had learned to put into practice himself the lesson which he was just communicating to them, regarding rejoicing in the Lord,—to cast aside anxious thought and to approach the Lord in prayer and supplication in thanksgiving, and he possessed the resultant peace. In this condition of heart, however many may have been his necessities, he was not in want, for he was satisfied that the Father would provide the things which he really needed—and more he did not want; for, as he explains, he had learned the lesson, “In whatsoever state I am, therewith to be content.” We are not to be contented after the manner of the tramp or the indolent and shiftless, who would prefer to “live by faith,” at the expense of others who “labor, working with their hands.” We are not to be content to allow the opportunities and talents and privileges which the Lord has given us to lie idly by, unused; but while using these talents and opportunities to the very best of our ability and intelligence, and while seeking in prayer and supplication, rejoicing and thanksgiving, to use them all as would please the Lord, we should be content with the result of such efforts. We should conclude that our heavenly Father who feeds the sparrows and who clothes the fields with verdure is quite able to supply our needs in the manner and to the degree that would be for our highest welfare; and so, after having done our part to the best of our ability, we are to be thoroughly contented with the results—even if the results should be the barest necessities of life. But we are not to be contented with the barest necessities unless these are the best results obtainable from a reasonable and judicious use of opportunities and talents which the Lord has given us, consistent with our consecration to his service. “Be content with such things as ye have” does not ignore our talents and opportunities, for these are part of the things which we have,—the things which, as stewards, we are bound to use to the best of our judgments. Surely the Lord was fitting the Apostle for a grand place in the heavenly Kingdom, when he gave him such a variety of experiences as are detailed in the 12th verse. Surely, as the Lord was touched with the feeling of our infirmities, that he might be a faithful High-Priest for the Millennial Kingdom (as well as to us now), so the Apostle, by his experiences, evidently was being fitted and prepared for a very honorable and prominent place in the Royal Priesthood of the same Kingdom. And so with us: if we find our experiences in life very checkered we may conclude that the Lord sees that we need both the heights and depths of prosperity and adversity to properly instruct us and qualify us for the position he designs for us in the future. Let us, then, as the Apostle did, learn how to abound, not allowing the abundance of earthly good things to swerve us from our consecration vows; and learn also how to be in want (need) and yet not to want anything beyond what the Lord’s wisdom and providence sees best to give,—to be content. Here are some free online articles in relation to the Heavenly Father — Jehovah, and his Son — Christ Jesus — “a ransom FOR ALL … to be testified in due time” (1 Timothy 2:6), as well as, about the holy Spirit (the invisible power and influence of God) with clear explanations about why the anti-Christ teaching of “the trinity” — introduced by the Roman Catholic Church system (the “Beast” in the Book of Revelation) — is not what the Bible teaches. The Bible Student Movement does not support the teaching of purgatory nor does it support the Roman Catholic System’s teaching about people being sent to a place where they burn up forever, which certainly does not reflect the perfect love of God — the Almighty Creator of all things. The Doctrine of the Trinity – Mystery or Confusion by Br. David Rice. The Origin of the Trinity – From Paganism To Constantine by Sr. Cher-El L. Hagensick. Development of the “Trinity Doctrine” by Br. Tom Gilbert. Understanding John 1:1 by Br. Richard Doctor. 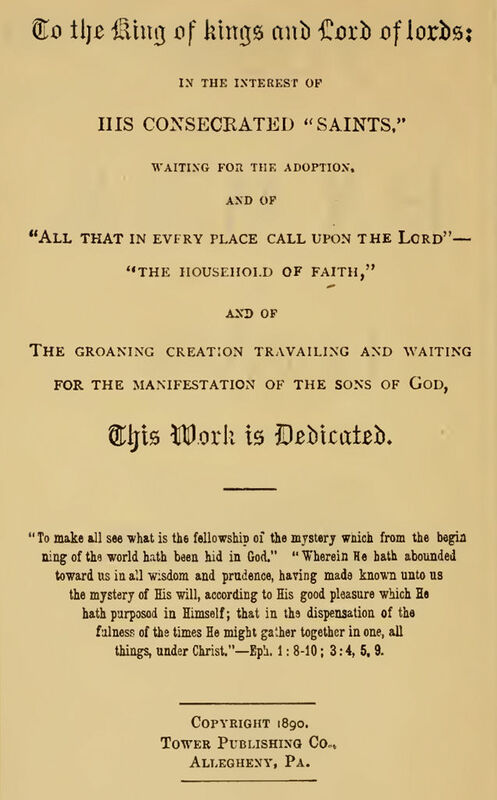 Those who will feel the deepest interest in this collection, and whose sentiments will be most fully voiced in its verses, will undoubtedly be those in fullest degree of sympathy with the divine plan of the ages, as set forth in the several volumes of Millennial Dawn—the eyes of whose understanding have been opened to the clearer, purer light now shining from our great Redeemer’s cross, showing the fulness and the completeness of his salvation. A Special Calling by Br. David Rice. The Herald of Christ’s Kingdom. July /August 2016. The Bride and the Bridegroom by Br. Carl Hagensick. A Verse-by-verse Study of Psalm 45. The Herald of Christ’s Kingdom. July/August 2004. A Chaste Virgin. The Herald of Christ’s Kingdom. Christ and His Bride. BIBLE Students DAILY. THE BIBLE — The World’s Best Model. Here is Why.